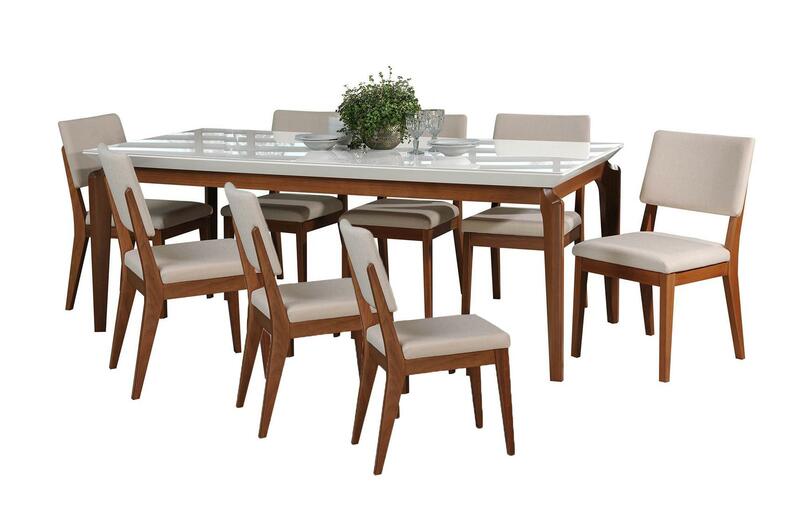 Dine in style, with the Payson dining table, modern design meets transitional functionality. Beautifully crafted, with space for eight of your favorite guests, this piece sets the tone for any dining space. Inviting yet elegant, a 4mm glass table top keeps your table protects and around for endless dinner parties. The piece blends well with any existing decor and can be dressed up with chairs of any style. A Mid-Century modern classic, the Dover Dining Chair blends simple and seamless design to add a timeless and sophisticated appeal to your home. Quality craftsmanship and solid wood frame, keep this chair durable and functional, making it the perfect dining room addition. Lean back into the comfortable upholstery and enjoy family gatherings seated around the table or in the living room. 9-Piece Mid Century Modern Dining Set for Dining Room Use. Table Measures: 82.67 in. Length, 31.49 in. Height, 39.37 in. Depth. Chair Measures: 17.32 in. Length, 36.64 in. Height, 16.3 in. Depth. Innovative Design Features include Curved Lines in its Feet with a 4MM Glass Top for Beauty and Durability. Unique Wood Frame with Lower Open Back Designed Chair.